"Be Kind With Your Voice"
World Voice Day is designed to share the excitement and importance of the singing voice — including the vocal arts, voice science and pedagogy — with the public and with funding bodies, joining forces and uniting goals with groups around the world. With participants from health practitioners, academics, and vocalists, World Voice Day serves to heighten awareness of and appreciation for healthy singing. Learn more at world-voice-day.org. The Barbershop Harmony Society is your source for a healthy voice! We are proud to offer several free offerings and resources to the public on April 16. Become an advocate for healthy singing or learn what you can do to improve your vocal health techniques today. 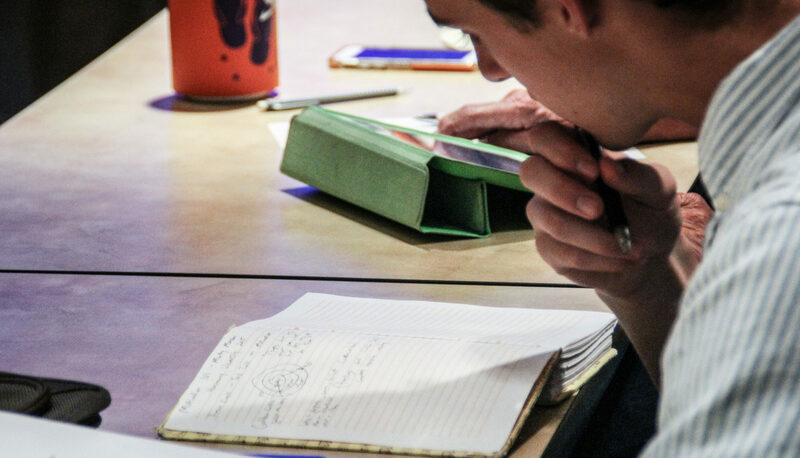 Reserve your spot to access free voice assessments and voice lessons from the Society's resident Music Education Specialist, Dr. Steve Scott, in person and online. Dr. Thomas Cleveland of Vanderbilt University will be joining us at Harmony Hall on April 16 from 2 - 3 p.m. to speak with us about the importance of vocal health. 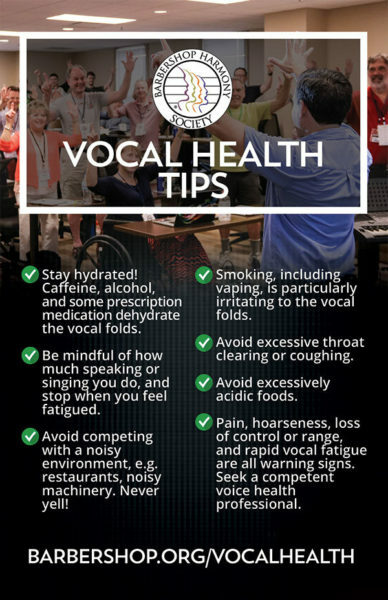 Download, print, and share our Vocal Health tip sheet to help spread the word about healthy singing. A voice assessment is intended for singers who are concerned about their vocal health and would like a second set of ears to listen and evaluate before going to a medical professional. The Society employs Steve Scott, a Singing Health Specialist trained to help injured singers to recover from a vocal trauma. He will evaluate the self assessment, run the singer through a small series of singing tasks, and guide the singer toward likely next steps. The Barbershop Harmony Society provides a free service of voice assessments. Voice assessments can be done live in Nashville and they can also be done via video chat platforms, such as Skype, Google Chat, etc. You will receive an "all-clear"
If you, a quartet-mate, or a fellow chapter member has a concern about their voice, they should see a voice care professional. To receive a Vocal Assessment appointment, please sign up online. Please contact education@barbershop.org with any questions. To schedule your voice lesson, CLICK HERE. Steve is an active a researcher, presenting at national and international music conferences. His research interests include the biophysiology of the barbershop singing voice, barbershop acoustics, and barbershop history. He is a certified Singing judge and is a frequent faculty member for Harmony University where he teaches voice techniques and vocal pedagogy. Steve is active as a voice teacher, youth chorus clinician, coach, and chorus director, and has sung in various quartets and choruses, including the medalist chorus Central Standard of Metro Kansas City, where he served the chapter as Vocal Coach. Steve is busy earning his Ph.D. in Vocal Pedagogy from the University of Kansas, and holds an M.A. in Vocal Pedagogy, an M.M. in Choral Conducting, and a Singing Health Specialization from Ohio State University. Join us at Harmony Hall from 2 - 3 p.m. for a lecture on the human voice from singing specialist Dr. Thomas Cleveland, Professor of Otolaryngology at Vanderbilt University. This event will be captured and available for viewing on our YouTube channel after the event. Thomas F. Cleveland is Professor of Otolaryngology in the School of Medicine, Vanderbilt University, Nashville, TN, where he teaches, conducts research, and is involved in clinical management and care of voice. Dr. Cleveland has lectured in 10 countries in Europe and Asia, and throughout the United States. 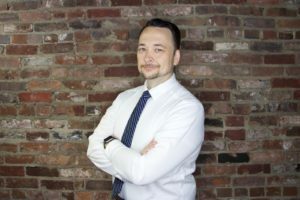 He is the author of over 80 articles, including research papers that have been published in The Journal of the Acoustical Society of America, National Association of Teachers of Singing Journal, The Journal of Singing, The Journal of Research in Singing, and The Journal of Voice. Dr. Cleveland holds a Ph.D. from the University of Southern California, and conducted graduate and postgraduate research at the Royal Institute of Technology, Stockholm, Sweden, as a Fulbright Scholar, and as the recipient of a grant from the Voice Foundation of America. He is an Associate Fellow in the American Laryngological Association. Become an advocate for healthy singing! Download and share the Vocal Health Tips and Benefits handout.